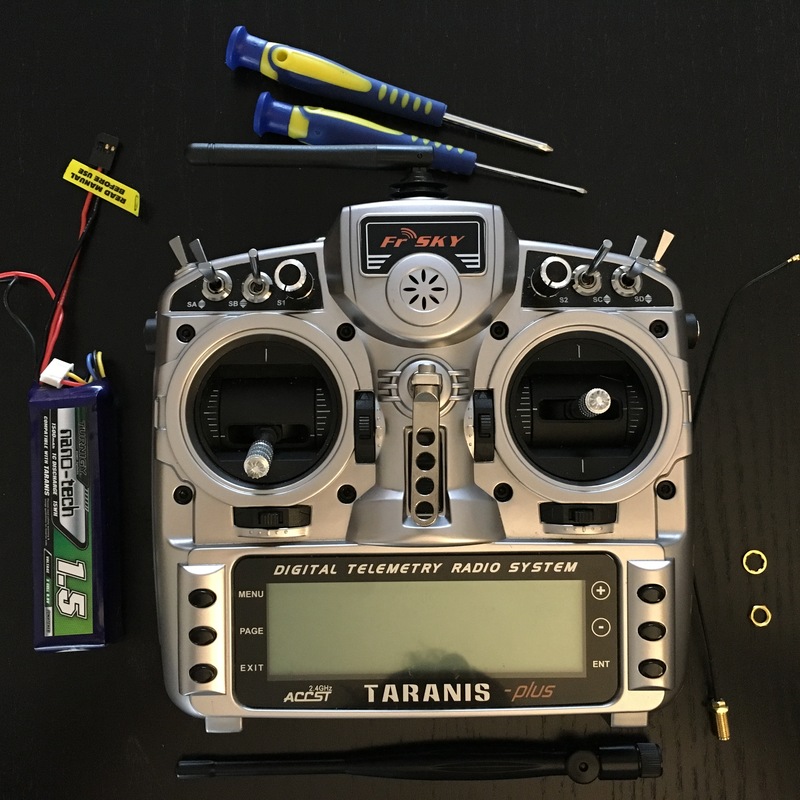 The FrSky Taranis is, in my opinion, the best radio transmitter money can buy. It’s not cheap, but it’s completely open source. I have a spare Turnigy 9x, but after a half year my gimbals are still almost rock solid, and the Turnigy receivers are to big. So, if it’s your first radio and you want a Taranis, buy one. 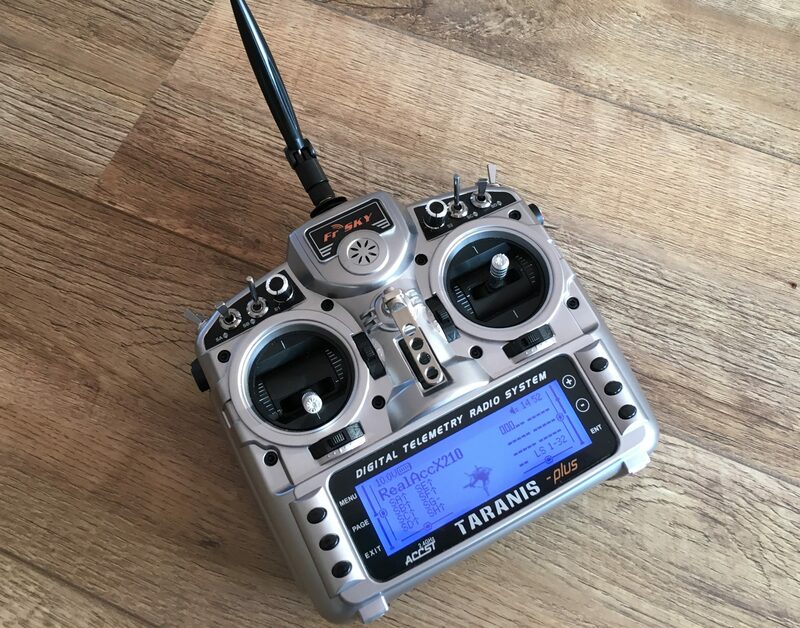 There are many possibilities and features for the Taranis available. But if it’s that good, why mod in the first place? You may ask. Now, because you gonna break stuff eventually. Your antenna is going to be the first of things to break (if you don’t store your radio well), and if you don’t care about warranty. You can fix it yourself. You will, because the gimbals will go bad after a year. So if you are scared to lose your warranty, do not progress any further. If you are not confident in soldering, do not proceed! I’m not responsible in any way. I’m only giving you a guideline. 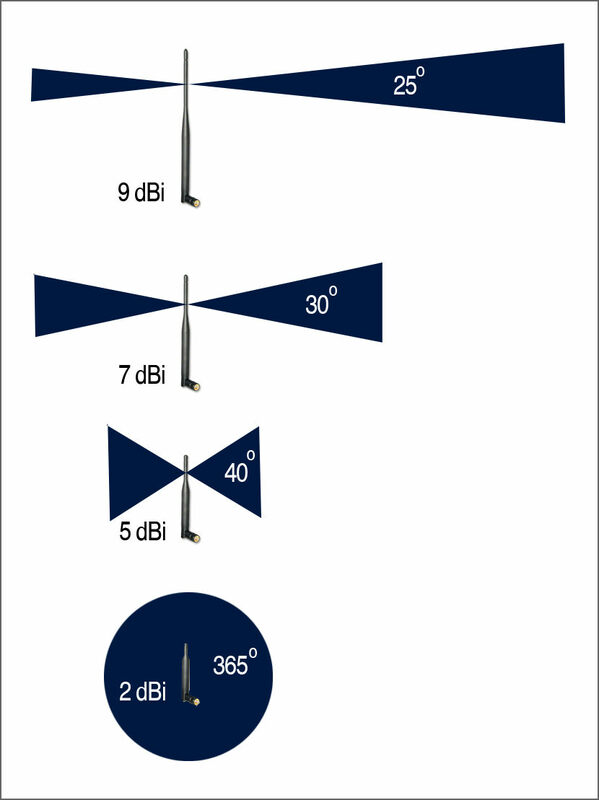 How to chose between 3, 5 or 10 dBi antenna? Simply saying, the higher the dBi, the further the signal goes. But the further the signal, how narrower the signal will send it in the field. See example here. Well isn’t 3dBi the best one? Sure, it will send the radio signal everywhere, but the range is much smaller. What’s the sweet spot? Well that’s what you decide. The most effective way to know is to simply try. With this guide you can try different Wifi Antenna’s. First thing you need to do is unplug your battery! You don’t want to short-out your Taranis. 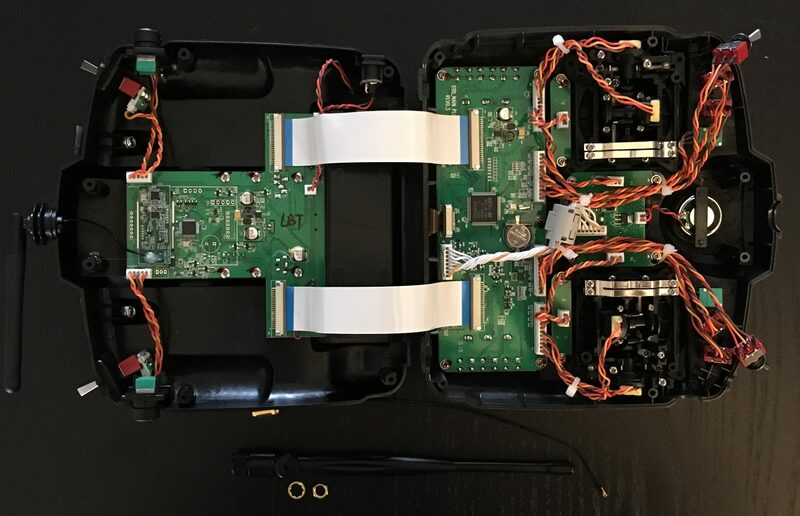 Then before unscrew and opening your Taranis, make sure you got all switches in the default position. It can happen that a switch will fall out, then you can put it back in the good order. Next are the philips screws, there are six of them in the backplate. 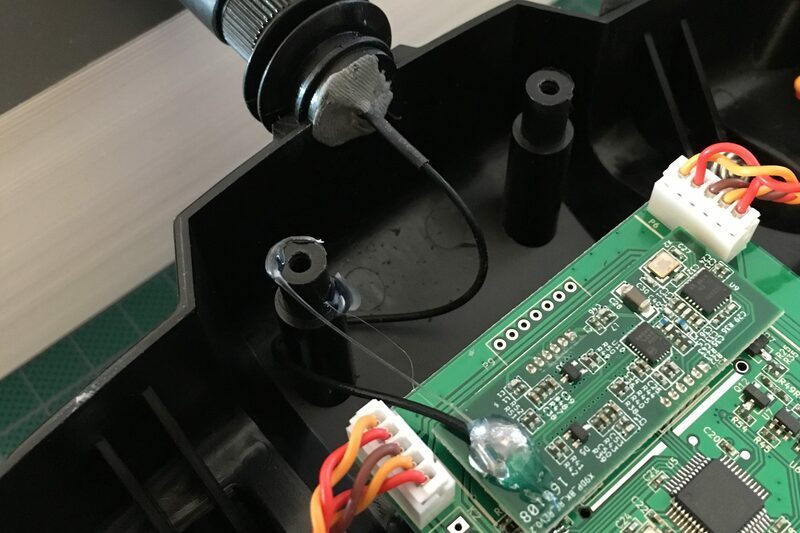 There is no need to unscrew something on the front of your Taranis. Be careful with opening your Taranis. You don’t need to use force, it will open up very easily. Once you opened up your Taranis you should see the 2,4Ghz stock antenna, the antenna wire and the spot on the board with the hot glue on it. 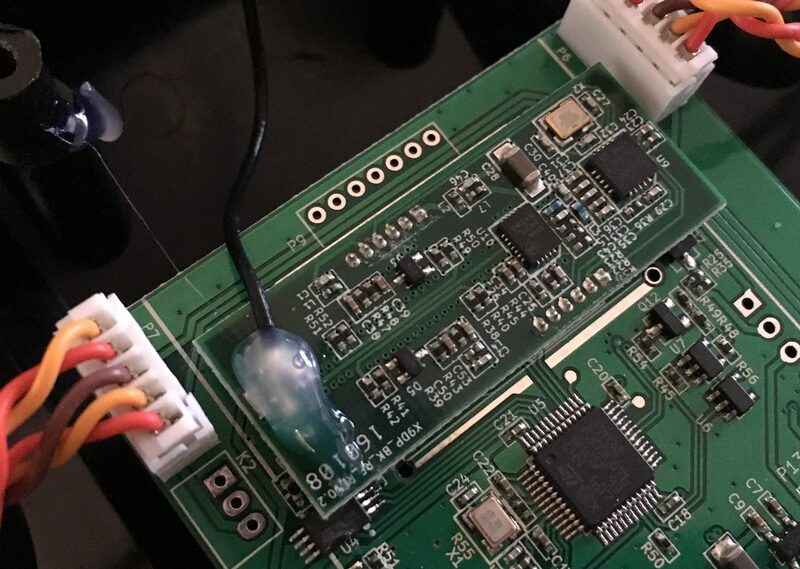 Underneath the hot glue is the solder that connects the antenna to the board. You can remove the hot glue by warming it up with a heat gun and wipe it clean with a cloth. 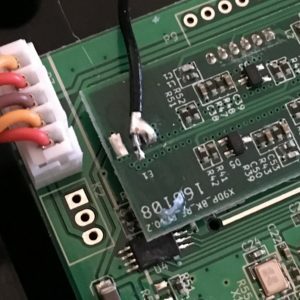 Be careful not to burn your board or Taranis in the process. When you are done with cleaning up the hot glue you can look at the solder. I did my best to magnify it. So yes, that’s small and you need a good soldertip. Simply unsolder the antenna cable, because we don´t gonna use this anymore. You can clean the pads with a wig or simply with your soldertip. Just be careful of soldering on the circuitboard. 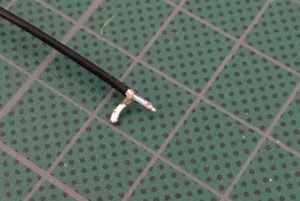 Use some proper pliers to disconnect the antenna plastic form your Taranis. Just a little force was needed. Next up is making your connection cable for the new 2,4 GHz antenna. I have used the 2,4 GHz RP-SMA Female to U.FL IPX 1.13 Pigtail. 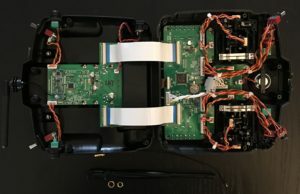 Just measure 11 cm from the RP-SMA connector to the IPX connector and cut it. Once you cut the wire you will need to use a hobby knife to open up the little cable. Just push the cable gently with your knife, a half centimeter before the cut. Once you done that you will see a bush of wires (a shielding layer) and one isolated wire. Grab the bush of wires and gently roll it between your fingers. Make sure (and yes a looking glass will be great!) that you got all the wires. One hair is enough to mess with your antenna output. Once you’ve done that you can solder them together. Next up is the tip of the isolated wire, you don’t need to cut it with a knife. You can easily do it between your nails. You need just 1mm of that wire and solder the tip. Now you are ready to solder it back on the circuitboard of your Taranis. But before you do that, make sure you your wire is through the hole of your Taranis (have enough space, but better double check it). The easiest way to do this is that you first solder the bush to the circuitboard. That will make your life easier. 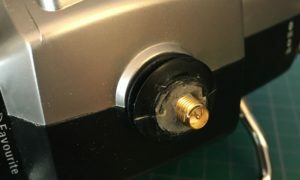 The tip is very small and the connection is very ‘fragile’ if you move it. Next up is make sure you got a good solder on your tip (use a magnifier if you have one). Then use a glue gun to cover it up again. This will give the connection more strength and it’s well isolated. To give your wire some room you can use the screwpillar and some hot glue to hold the wire free in your Taranis without moving it. 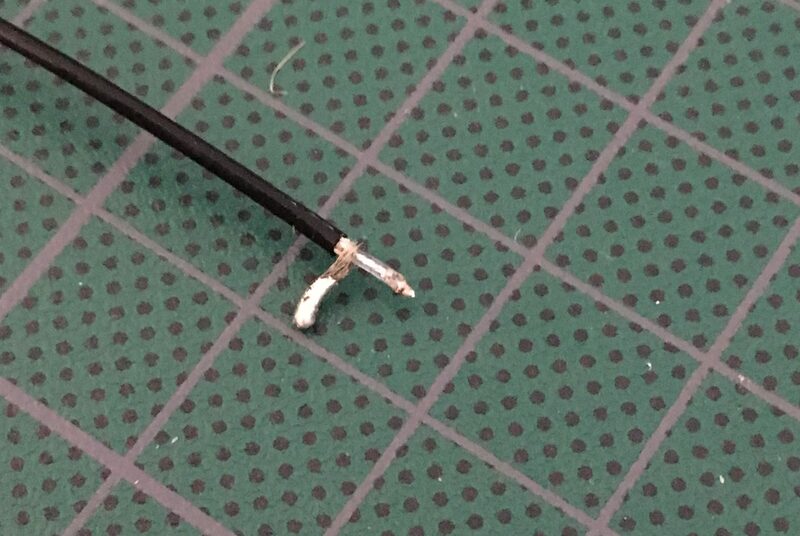 Then you need some Epoxy Repair (Dual-Component epoxy putty) to fill the hole were the original antenna should be. There are many ways to do this, and this is one of them. I’m not going to change the wire again so I need a rock solid solution. Just use a little of the putty and knid it well for about 1 or 2 minutes. When the putty is grey (see picture) apply it on the 10mm screw connection of the RP-SMA and make a little ball. Then push it in the hole. It must fill up nicely. Push the putty to make sure you got it all solid in the hole. You can remove any putty with a wet knife. The epoxy need to harden. It will take about 5-10 minutes. Make sure you hold it straight and the antenna is connected properly. I used some books to make sure it’s straight. When the epoxy is hard enough you can screw your Taranis together. Use a sanding tool to smoothen the epoxy and you can paint it if you want. The epoxy can be painted! Screw your new x dBi antenna to the Taranis. Note: Make sure the antenna is on your Taranis when powering on! Otherwise you can burn your transmitter. You will need to test your Taranis in two ways. One is your RSSI and second is your SWR. 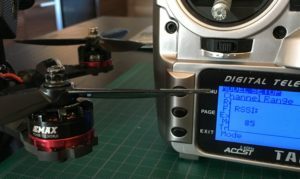 The RSSI [Range] on your Taranis must be stable when moving away from your Quadcopter. The fluctuations are there, but must be counting down equally the further you move away from it. Don’t be shocked by a bad RSSI at 85. It’s normal that you have a bad connection within 2 meters from your receiver. To test if your antenna is actually good is to test the SWR (Standing Wave Ratio). You can access your SWR via a page in the Taranis Menu. Menu > Page 12/12 > Screen 1 (set on “Bars” or “nums” whatever suits you) and set your first input on SWR. Then Exit > Exit. If you hold the Page button you can see your SWR. Your SWR must be 0(zero) or 0 to 1(zero to one). 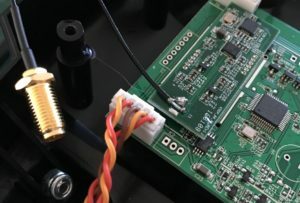 Any greater number means your antenna or your connection to the circuit board is not good, you need to check that! To see if your antenna is working properly, you can grab the antenna. You will see an increase of numbers, when you do, applause! You have done it well! If see a number bigger then 16 (and you are not holding the antenna), your quadcopter will have a very, very bad connection. The only thing left is… Yes! 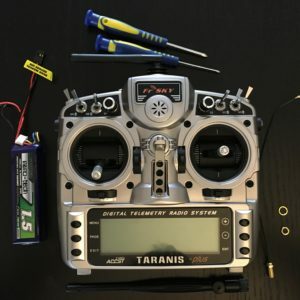 Fieldtest your Taranis mod! Happy flying folks! 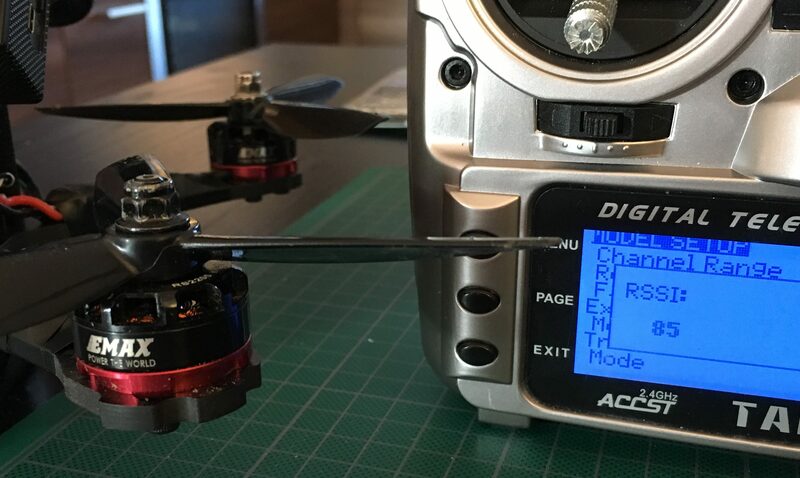 The tutorial was kindly written and provided to us by DutchWalnut_fpv. Make sure to follow him on Instagram and like our Facebook page, so you wont miss any new how-to´s. SWR actually VSWR (Voltage Standing Wave Ratio) is related to the Vforward and Vreflected. In a perfect match Vr = 0.0, plug in the numbers and VSWR = 1.0 for a perfect match.